It seems that nearly every jazz album made today comes with ringing endorsements from jazz greats, PR-driven plaudits, and the participation of one or two (or more) heavy hitters. So how do you separate hype from reality? Simply open your ears and listen. That's how you separate the wheat from the chaff, and that's how you discover true talent like Katie Thiroux. This bassist-vocalist-composer is flat out phenomenal. 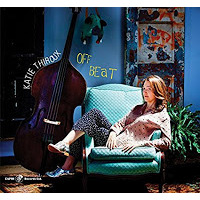 On her Jeff Hamilton-produced debut, Thiroux walks the classy-and-swinging line favored by Ray Brown and his ilk. She provides in-the-pocket, full-bodied bass lines, warm and inviting vocals that demonstrate a real understanding of a lyricist's intent, and original compositions that place her firmly in the tradition. Across eleven tracks, Thiroux shows that she's the complete package. There's a winning solo bass-and-voice number to admire ("Wives And Lovers"), a smoky and attractive original ballad that operates with a "Mood Indigo"-esque demeanor ("Can't We Just Pretend? "), a bluesy ode to Brown ("Ray's Kicks"), and a swinging Frank Foster classic ("Shiny Stockings") that features Thiroux's sly yet direct vocals. Not enough for you? Then there's also a beautifully-shaped Rodgers and Hart classic ("There's A Small Hotel"), some burning double-time work ("The One I Love (Belongs To Somebody Else)"), and a smile-inducing solo bass capper ("Oh What A Beautiful Morning"). Young guitar phenom Graham Dechter, Hamilton protégé Matt Witek, and veteran saxophonist Roger Neumann join Thiroux here, and all are fully engaged in the music at hand. Neumann cooks on the spry "Rosebird," Dechter burns on "The One I Love (Belongs To Somebody Else)" and wafts along behind Neumann on "Can't We Just Pretend?," and Witek proves to be a model of taste, coating a song's underbelly with gentle brushwork and providing the requisite swing feel in numerous places. Thiroux couldn't have asked for a better set of band mates for a project like this. 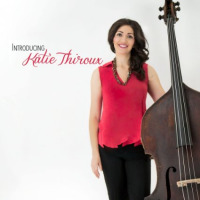 Introducing Katie Thiroux may be a first step for this young triple-threat talent, but it plays like the work of a well-seasoned veteran. Track Listing: There's A Small Hotel; Don't Be On The Outside; A Beautiful Friendship; Wives And Lovers; I'm Old Fashioned; Ray's Kicks; The One I Love (Belongs To Somebody Else); Rosebird; Can't We Just Pretend; Shin Stockings; Oh What A Beautiful Morning. Personnel: Katie Thiroux: bass, vocals; Roger Neumann: tenor saxophone; Graham Dechter: guitar; Matt Witek: drums.